1) Where Do Miniature Cattle Come From? Miniature Herefords were bred by the Largent family of Texas (United States of America) and the breeding program commenced in 1970's. No. Miniature Hereford cattle have been deliberately bred smaller and originate from top quality bloodlines, all proven free of dwarfism. They do not carry the Achondroplasia (dwarfism) gene and therefore there is no risk of a genetically generated deformity or abortion. Calf losses are extremely small and even heifers show ease of calving. Newborn calves are vigorous and healthy. 3) What Are They Good For? 4 ) Are they a novelty? Miniature Cattle are naturally quiet in temperament, are easy to handle and raise. This makes them very popular for small acreage farmers, they are also fast being seen to have great advantages to the large beef farmers, who are looking ahead to smaller high quality cuts of meat, along with the advantages of less damage to pasture and facilities and more efficient feed conversion with higher carcass yields. This makes Miniature Cattle a very dual purposed animal suited to all our different requirements. 5) Is there a market for the meat? 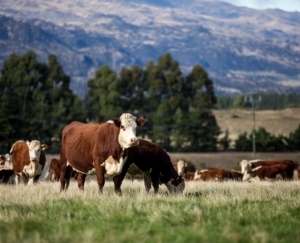 Miniature Cattle are still relatively new here in New Zealand so we still have a way to go before we have our own direct market for this high quality meat. Australia already has an established demand for the wellmarbled, yet lean carcasses of Lowline Cattle through beef companies that market direct to hotels and restaurants. I see that this will follow in New Zealand with Miniature Hereford Cattle However, the biggest challenge facing the current breeder market is to build up enough numbers of stock. To do this we need to increase the numbers of breeders and NZMHBG Members and do more marketing to increase awareness of the breed Due to their smaller more convenient size, Miniature Cattle will also become very popular for the home kill market, as these are not too much for the average home freezer. 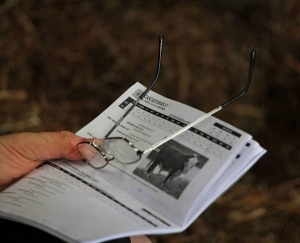 There are four categories of opportunity for breeders. Because there a so few Miniature cattle in the world they will have appeal to the collectors of exotic animals. This market is growing as more people purchase acreage to create their own little haven, and keep more unusual animals. Over the next few years there will be demand for Miniature Cattle for breeding programs as people build up good quality bloodstock. • Up-market butcheries and delicatessens. There is and increasing demand from dairy and beef famers for smaller bulls for use over their heifers.